On October 21st, 1879, in one of the most famous scientific tests in history, Thomas Edison debuted his signature invention: a safe, affordable, and easily-reproducible incandescent lightbulb that burned for thirteen and a half hours. Bulbs tested following that lasted for 40 hours. Although Edison cannot fairly be credited as the sole inventor of the lightbulb, his final product—the result of years of collaboration and testing alongside other engineers—revolutionized the modern industrial economy. Below is a timeline of major milestones in the development of this world-changing invention. 1809 - Humphry Davy, an English chemist, invented the first electric light. Davy connected two wires to a battery and attached a charcoal strip between the other ends of the wires. The charged carbon glowed, making what became known as the first-ever Electric Arc Lamp. 1820 - Warren de la Rue enclosed a platinum coil in an evacuated tube and passed an electric current through it. His lamp design was worked but the cost of the precious metal platinum made this an impossible invention for wide-spread use. 1835 - James Bowman Lindsay demonstrated a constant electric lighting system using a prototype lightbulb. 1850 - Edward Shepard invented an electrical incandescent arc lamp using a charcoal filament. Joseph Wilson Swan started working with carbonized paper filaments the same year. 1854 - Heinrich Göbel, a German watchmaker, invented the first true lightbulb. He used a carbonized bamboo filament placed inside a glass bulb. 1875 - Herman Sprengel invented the mercury vacuum pump making it possible to develop a practical electric lightbulb. As de la Rue had discovered, by creating a vacuum inside the bulb an eliminating gasses, the light would cut down on blackening within the bulb and allow the filament to last longer. 1875 - Henry Woodward and Matthew Evans patented a light bulb. 1878 - Sir Joseph Wilson Swan (1828-1914), an English physicist, was the first person to invent a practical and longer-lasting electric lightbulb (13.5 hours). Swan used a carbon fiber filament derived from cotton. 1879 - Thomas Alva Edison invented a carbon filament that burned for forty hours. 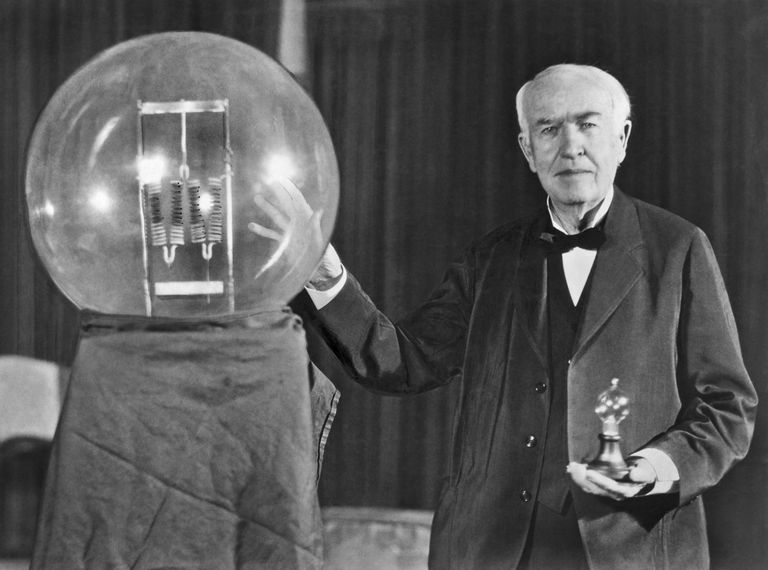 Edison placed his filament in an oxygen-less bulb. (Edison evolved his designs for the lightbulb based on the 1875 patent he purchased from inventors, Henry Woodward, and Matthew Evans.) by 1880 his bulbs lasted 600 hours and were reliable enough to become a marketable enterprise. 1912 - Irving Langmuir developed argon and nitrogen-filled bulb, a tightly coiled filament and a hydrogel coating on the inside of the bulb, all of which improved the efficiency and durability of the bulb.